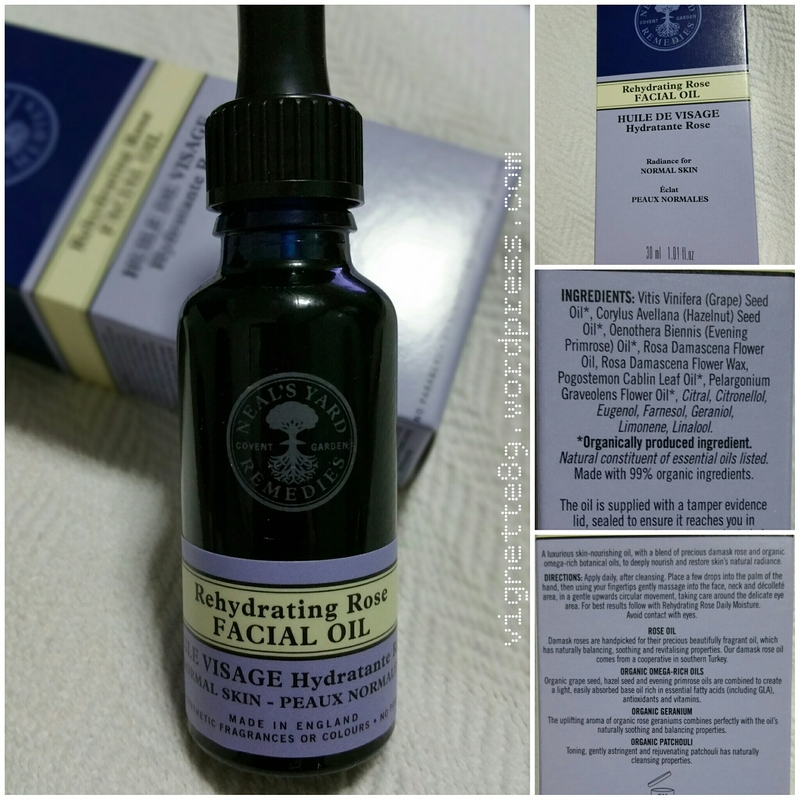 I have been using NYR’s Rehydrating Rose for a few weeks now and I am very please with the product. Vitis Vinifera (Grape) Seed Oil*, Corylus Avellana (Hazelnut) Seed Oil*+, Oenothera Biennis (Evening Primrose) Oil*, Rosa Damascena Flower Oil, Rosa Damascena Flower Wax, Pogostemon Cablin Leaf Oil*, Pelargonium Graveolens Flower Oil*, Citral, Citronellol, Eugenol, Farnesol, Geraniol, Limonene, Linalool. After toning your face, place 2 to 3 drops in the palms of your hands to spread before applying on your face. This helps to warm the oil to increase absorption by your skin. Spread the warmed oil on your face, always starting from the center and gently spread outwards. I usually will start from the tip of the nose and then the cheeks towards the ears. For the forehead and chin, i will place one of my warm hands with oil on either sides and apply the product before massaging in: horizontally left and right for forehead, upward motion to either side of the cheeks from the chin. As i work in air conditioned room everyday, i may take one more drop than my usual dose so that I can use the product like a mask to hydrate my skin further. If you do just like me, remember to use a tissue to dab off the excess oil on your skin before applying a light moisturizer over your face to seal in the moisture. If you use the oil at night like me, you should find that your face brighter and more dewy in the morning. I just love this product! All NYR outlets! There is only one NYR outlet in Singapore at Millenia Walk Level 1. Its a small outlet with limited products compared to the outlets in UK. Alternatively if you are into online shopping or daigou you can check out Taobao, Amazon or Qoo10 to see if anyone carries the product into your country.